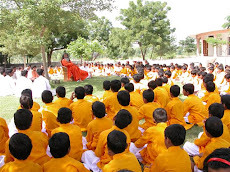 Information about what is going on in Shree Vishwa Deep Gurukul Maheshwaranand Ashram School, a charitable school established for needy village students by Paramhans Swami Maheshwaranand Puri ji Maharaj in Pali District, Rajasthan (India). The school gives a focus to girls education. Jadan School is a Senior Secondary Hindi Medium school affiliated with the Rajasthan Board offering Science, Commerce and Arts Faculties. The students who participated in children's day celebrations in the competitions for art, mehendi, rangoli and handwriting received their awards today. Congratulations to all!!!!!!!!!! Dance, song and colour. Celebrating children's day. 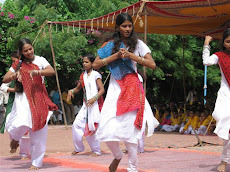 Children's day was a day of art, decoration, colour, dancing and roleplaying. The children of 1st and 2nd class dressed up as characters from Indian history and mythology. Their lives were celebrated with song and dance. The boy is dressed as Jawaharlal Nehru, who's birthday is on the day of Children's day. 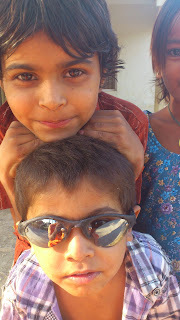 At his behest India celebrates it's future, the children, on this day. All of the girls seem to be experts at doing henna designs. Consider that in this program they have a maximum of 30 minutes to do both hands. They are pretty good!! Sorry about the quality of photos, you can't really see the intricate detail. This is a view of the school as at September 2011. 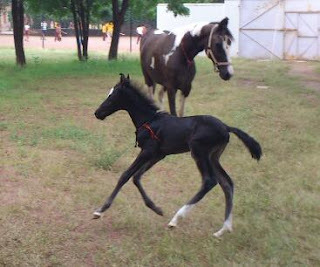 For those interested Google Earth has updated their images of Jadan Ashram to photos from 2010. It is interesting to see the Om Ashram, Hospital and School. Enjoy. 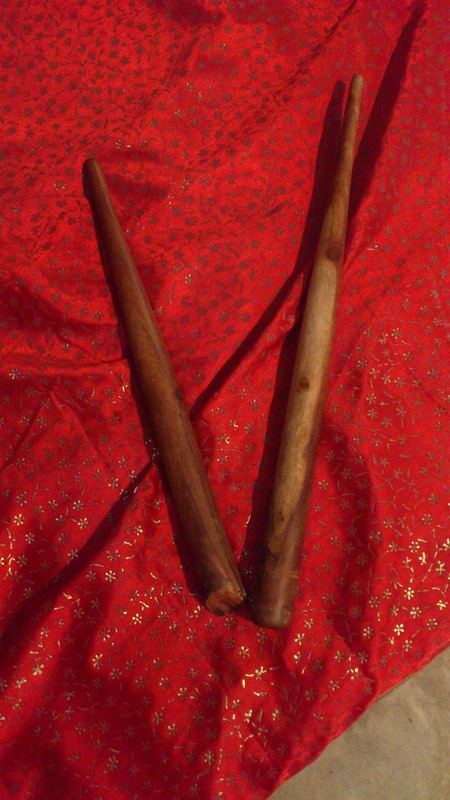 For those who were in Strilky and were listening to the satsang about meditating on the sound of one stick. These are the sticks. I was back in school yesterday after two months in Europe. It is so beautiful to listen to the children sing again. Hari Om to everyone in Europe and to all the kids who were in Strilky. Siddhi, our new foal, enjoying her first run out of the stable with her mum Ganga. Beautiful. 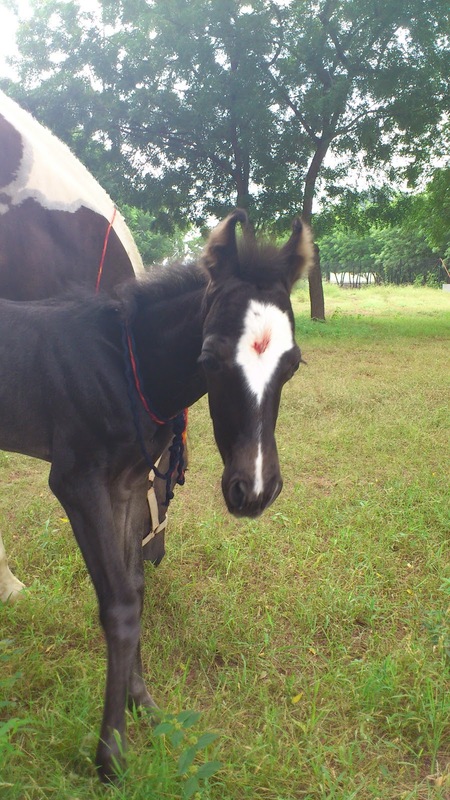 The latest addition to our horse stable is Siddhi. Today was her first day out running around and boy can she run. Yesterday I was in school for the first time since going to Europe for two months. It is so beautiful to hear the children singing and see their smiling faces again. In tenth class we had a huge batch of 101 students. Of those students 95 passed. Three of the students scored above 85% which is a huge mark in the 10th board, up in the merit rankings for our district. Interestingly the 10th class is often the most difficult for the students to pass. The maths is difficult and those who don't have a "maths brain" have trouble. Once they get through tenth there isn't any compulsion to take maths so those students breath easy. A mind boggling fact about the Rajasthan board 10th examinations. One million twelve thousand students sat the 10th class examinations!!!!!!!! 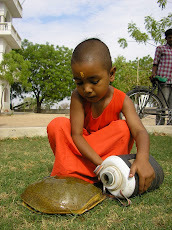 That is only in Rajasthan state. The overall result was that 73.7% of students passed. Our students have done much better than that average. Well done once again. The students of 12th Arts have outdone themselves. 51 students and all have passed with flying colours. The top student is Prakash with a mark of 77.5%. Well done to all. The science results for 12th class have come. Out of a total of 39 we had 18 in 1st division, 19 in 2nd and two failed :(((((((( better luck next time boys). One of the girls, Manisha, managed to score 86.15% which puts her 11th place in the district. Outstanding. She scored 93% in Physics which is truly excellent. Congratulations to all. Now we are waiting for the Arts students results to come. End of year "Report Card"
Another year at our school has passed in the blink of an eye. The year ended on a high note with our Principal, Shree SL Ojha, receiving the “Dronacharya” award for outstanding educational work from Udaipur University. It is a big award with people from all over Rajasthan being nominated and more than 30, 000 people at the awards day. It is just reward for his dedication to teaching throughout his whole life. Perhaps the greatest sign of his success is that he was nominated by students of his from 10-15 years ago who still remember his work. Congratulations Principal Sahab!!! The highlights of the year have been many. Science students winning competitions, sports success, students getting in the merit lists in exams, our 12th class students getting admission into highly prized courses such as medicine and engineering, Sanskrit students winning prizes…. The list goes on. But the real highlights were the harmony between the students, the concentration, unity and dedication of the staff and the joy of the primary students as the proudly showed everyone who had time to look just how much they had progressed throughout the year. Another favourite from the year was when Yashoda taught Avatarpuri and Rajendra Puri knitting. They loved it and a few days later I saw Avatarpuri gliding past on his “rip stick” – a funny modern skateboard – whilst knitting a scarf at the same time – THAT is multitasking!! To all those who supported us during the year from all over the world thank you endlessly. 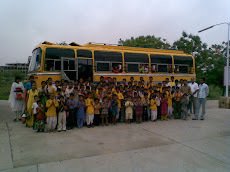 We had sponsors for school buses, furniture, computers, library books and somehow the miracle workers who run the Gyan Putra scheme managed to find enough sponsors for the 548 students who have scholarships in the scheme. For the statisticians amongst you we had 1263 students in school this year, 357 of them girls and 105 boys in the hostel. In College we had 96 students, 49 girls and 47 boys. We were lucky to have some great volunteer teachers during the year. Thanks to Yashoda and Mark who contribute so much not just to the students but also to educating the teachers, bringing colour and joy to the classroom. Lorena from Chile gave the girls a chance to practice speaking English even when the school day ended, Rodney taught the kids how to speak proper ‘stralian slang English pronunciashun and my Mum who I hardly saw when she was in Jadan because she was always in primary school giving stickers and checking notebooks!! In the coming weeks we look forward to getting the results of our first batch of Commerce students, who finished 12th class this year. The results of all the students are eagerly awaited by the end of May. We are also starting up a new course in College ( Bachelor of Computer Applications) which will cater to the demand of students throughout the area and double the number of students in the first year of College. And in school we already have the daily line of parents and students coming for admission, which will go on now until July! Once again thanks to all for your continuing support and looking forward to see all the students again on the 27th June for another year of joyous learning opportunities. Mahashivratri in school was a great event this year. We had a wonderful function at school followed by the boys dancing and doing puja all night. Such a great energy, full of intensity. You may notice that the Shiv linga was actually made by hand by the hostel boys from dirt and cow dung. They were working on it until four in the morning. In the Indian tradition they have an ancient saying “Vasudeva kutumbhakam” – the whole world is one family. It is a truth that if realized would solve a lot of problems. 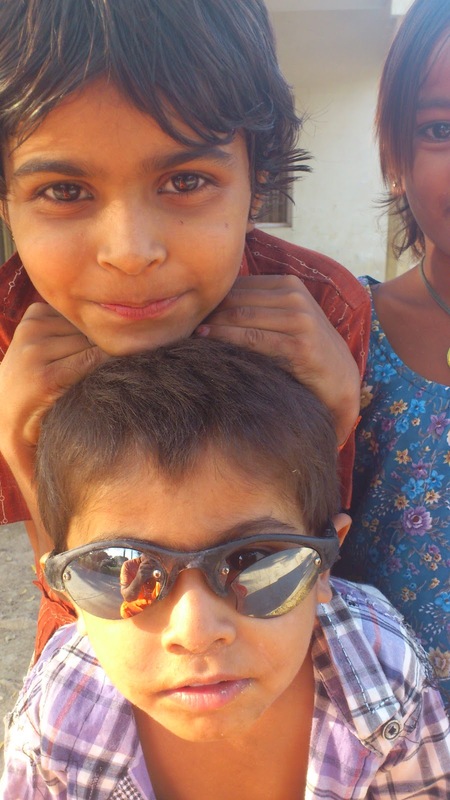 We invite you to join us in being part of the amazing development unfolding here in Rajasthan. 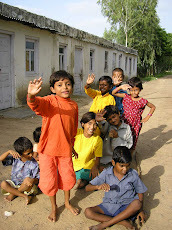 In 2001 Shree Vishwa Deep Gurukul Maheshwaranand Ashram started a school for the local village children. 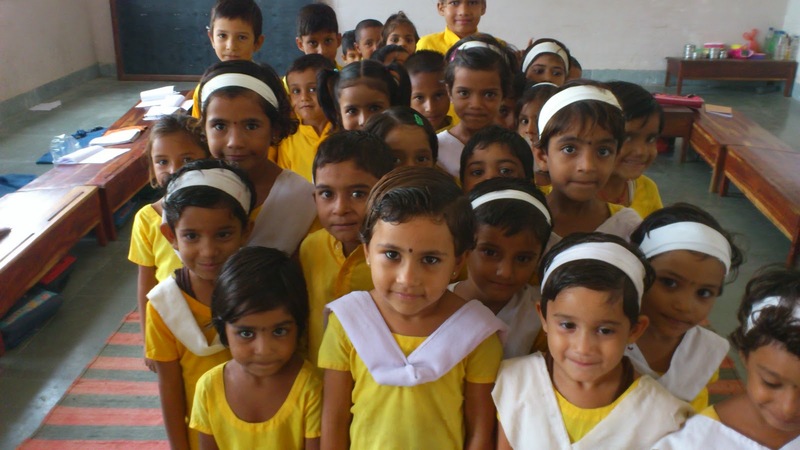 The school started with 140 students and went up to 5th class. It was makeshift and bodgy but it fulfilled our aim which was to give the children a better education than they get in the village. The idea of starting a school stemmed from the realization of the poor standard of education available locally and the lack of opportunities for students to get quality education. Now in 2014 thanks to the help of our Guruji, His Ashrams throughout the world and a host of generous donors from all corners of the globe we have a school that has 1350 students going up till class 12th. 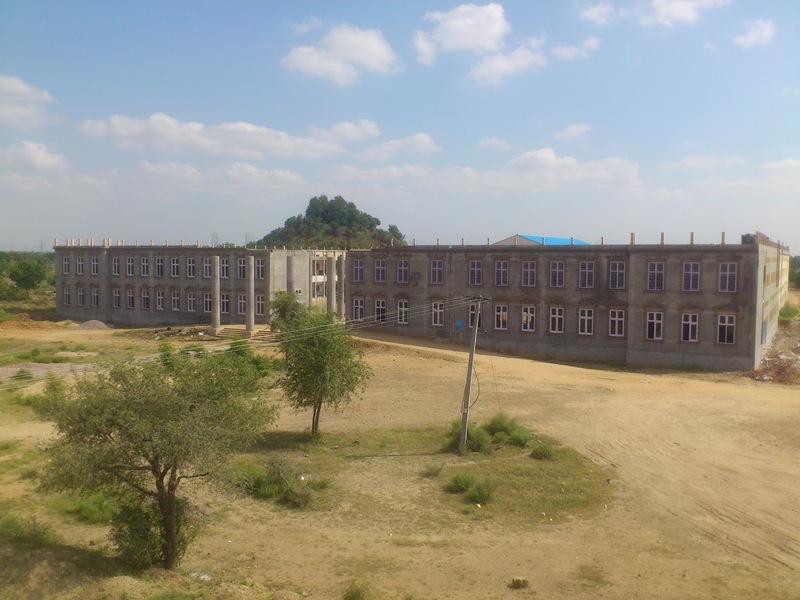 In November 2007 we opened a new school building where we can fit 900 students and in 2008 had to extend it! It is the only school offering science and commerce subjects in 12th class within a 20km radius with fully equipped labs and a great teaching staff. There are two girls who joined the school in 2001. They came from a village with 4 houses, no electricity and a family that was completely illiterate. Neither of them could write their name and they joined 4th class. 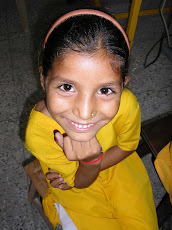 In May 2007 they completed 8th class and sat the examinations of the Government board (8th class examinations are the first “big” examinations held across the whole state of Rajasthan, similar to the school certificate of 10th class in Australia). I don’t know how to describe the beauty of the moment they received their results. They looked ……..and looked again. Asked someone else to check. Their eyes got bigger. Joy spread across their faces. Not only had they passed but they both scored in first division! It was special – beyond their dreams- bringing tears to their eyes (and ours). There are so many stories and experiences that one would like to share but your time is short and we have to go to school! We hope that you will also join us. We are constantly fighting to try and fulfill the demands of the local community. Everyone is welcome to join us on the journey. 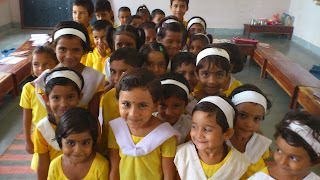 For example you can help with fundraising for buses or for construction works, by donating to pay for a child's education, for new computers, a new bus, playground equipment, supply of fresh water or with any other idea or opportunity which you may think will be helpful. If anyone is interested to help please be in touch by email at jadan@yogaindailylife.org and we will give you details of how to send donations to our charitable society in India. Alternatively you can give it to one of the Yoga In Daily Life Centres throughout the world, giving it specifically for the Education Fund of Shree Vishwa Deep Gurukul Maheshwaranand Ashram. They say “Bund bund se talab bhar jate he”. Drop by drop the dam becomes full. Our school is a drop in the ocean of the world's illiteracy. Each small donation is also only a drop in the dam of the cost of the school. But it all adds up. If you can help, thanks. If you feel it appropriate then please pass this site address on to a friend or put it up at your workplace. Any effort is welcome. Some videos on You Tube. Do you want to be a part of the journey? * Help with funding the construction of the extension of the school building. 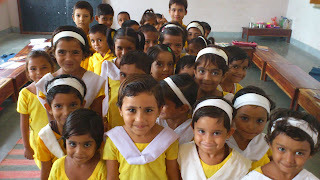 It is a big project with each classroom costing on average 450, ooo rupees ( approx. 13000 aud or 7500 euro). Any help gets us closer to the goal. * If you are a teacher overseas and would be interested in making some cultural exchange with our students we now have better internet access and would be interested. * Over the years we have had kind groups and people send judo uniforms, sports equipments, science equipments, donations for furniture, encyclopedias, computer learning games, text books from syllabuses in other countries, cameras, toothbrushes (!!!!! )..........the list is long and varied. The only limit is imagination. 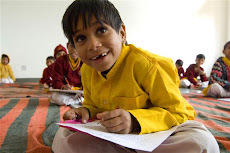 * All of our girl students and the boys who come from the poorest families are given scholarships under the Shree Deep Madhavanand Ashram Fellowship's Gyan Putra scheme. Gyan Putra means the child of knowledge and the scheme sponsors each child for their school fees and other expenses. For more information about this scheme see the website www.yogaindailylife.org . * Hopefully you can enjoy this blog and share it with others. Any suggestions on what you would like to see or know more about from our blog page are more than welcome. A while back an educationalist from a reputed school in Delhi visited our Ashram. He told a story of a visit that he had made to a village only a few weeks before in which he was thinking to set up a literacy program. "We don't want to go to a literacy program, we want to go to YOUR school, the one where you were educated". What they wanted to say is that they just need a chance, an solid education with all the opportunities for learning that their middle class cousins in the city can get. And that when they get that chance they will take it with both hands and prove that they can change their situation, can change the future of their immediate families and can be ready to give their own children the chances that their parents didn't have. Similarly our students are proving that when they get the chance to get a certain level of quality in education that anything is possible. The leaps that students have taken over the past few years is incredible. 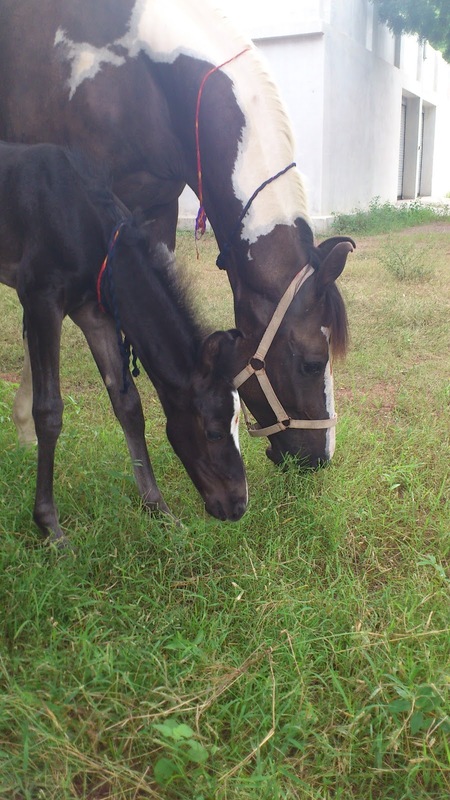 It is humbling and inspiring to see the way that they apply themselves to make the most of their chance. What can one do but enjoy watching their lives unfold and blossom.